Do you know what you are wearing June 13 – 16? Neither does Ian Poulter and he likes it that way. All of this is good news for you as IJP Design has created another clever contest around Poulter’s sartorial freedom at Merion called Major Bingo. 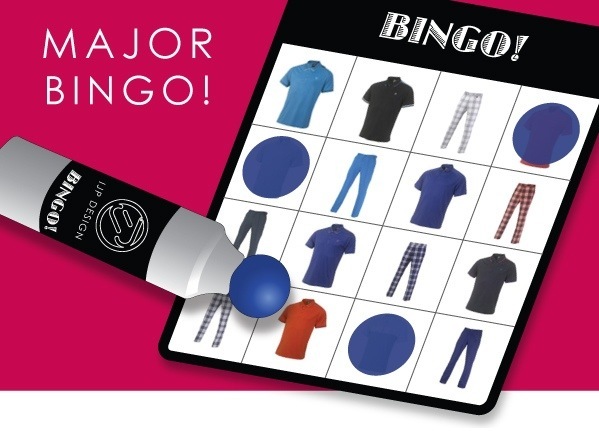 To win, simply select one shirt and one pair of trousers from a Bingo-like board. If your selection matches one of Poulter’s selections for the U.S. Open, you are entered into a drawing to win that ensemble. This may seem simple on the surface. Just pick a shirt and a pair of trousers that match, but there are a lot of variables in play here. The color palettes in the current IJP collection are very interchangeable which gives golfers the luxury of creating unique looks through a combination of shirts and trousers. This certainly increases the difficulty in picking the winning combination. Weather will also play a role in the selection of colors and fabrics, but the biggest wild card may be the fiery Brit’s mood. Will a pair of classic greys set the tone for a steady opening round? Or, will a Sunday charge be fueled by a pair of bold tartan trousers? As a marketing professional by day, I love to see how brands develop creative contests like these to keep people engaged with the brand and their ambassadors, and the folks at IJP Design are some of the best at doing this. My bingo card has been submitted, but I’m keeping my outfit a secret as I’m sure it is the winning look. There are only a few days left to enter, so get going. Maybe you’ll be the one yelling, “BINGO!” in some new tartans from IJP Design.